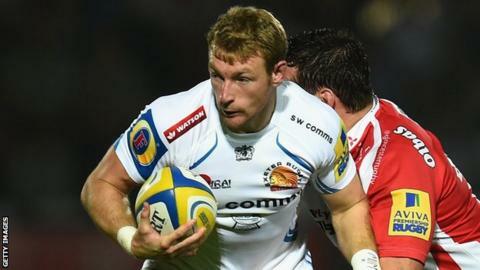 Exeter Chiefs winger Matt Jess says he would be proud to spend a decade at Sandy Park after signing a new deal. The 30-year-old, who earlier this week, first signed for Exeter from Launceston in 2008 when the club were in the old National League One. "I'd be massively proud," Jess told BBC Radio Devon. "To hopefully be here for another three years and get that 10-year service would be outstanding." Jess has been with the Chiefs through many of the club's major recent achievements, including gaining promotion to the Premiership in 2010 and winning the LV= Cup in March this year. The former Cornish Pirates and Newport Gwent Dragons player has scored 51 tries in 162 appearances since his switch to the Devon club. And he says the current Chiefs side is performing like no other has since they won promotion to the top flight four-and-a-half years ago. "We've certainly taken steps this year, obviously you can see we're third in the Premiership, top of our European pool and top of our LV= Cup pool. "We've never had that vein of form in the Premiership years I've had here, so to be able to carry that on is something that all the players are looking forward to. "The ethics are hard work and you want to reap the rewards. Last year we didn't really get the results we wanted to, but this year we've pushed on to another level."